The Alberta Firefighters Curling Association will be celebrating our 60th Annual Championship in 2019. 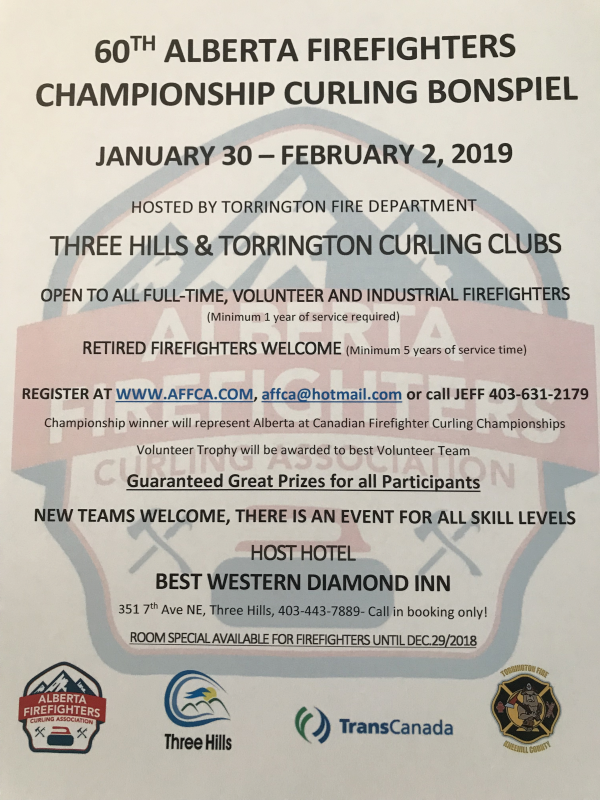 Firefighters from TORRINGTON Fire Department will host Firefighters from across Alberta who will compete for the Provincial title Jan. 30 - Feb. 2, 2019 at the Three Hills Curling Club and Torrington Curling Club. The eventual winners will travel to Kelowna, BC to represent Alberta at the Canadian Firefighters Muscular Dystrophy Curling Championships March 22 - March 30, 2019. Please find more details about our upcoming event in the 2019 Event Page. ENTRY FEE $540 but includes 3 meals and a great prize for all curlers!!! NO DIRECTIONAL BROOM HEADS ALLOWED!! !